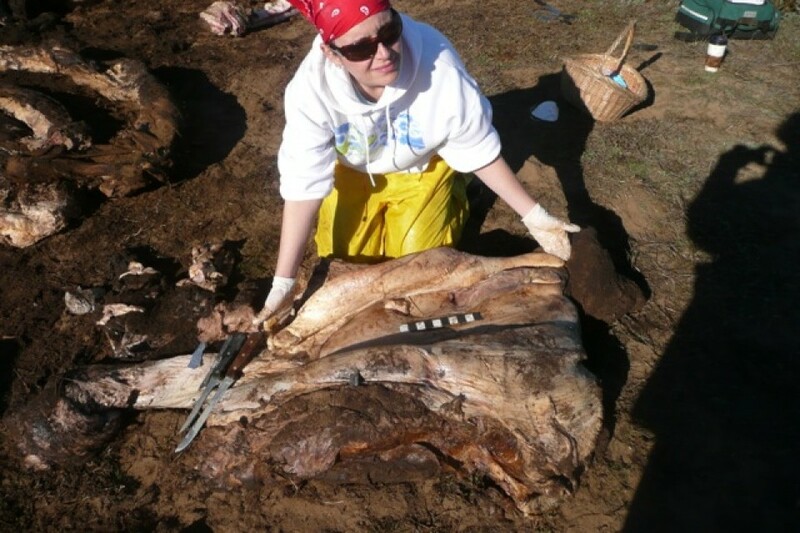 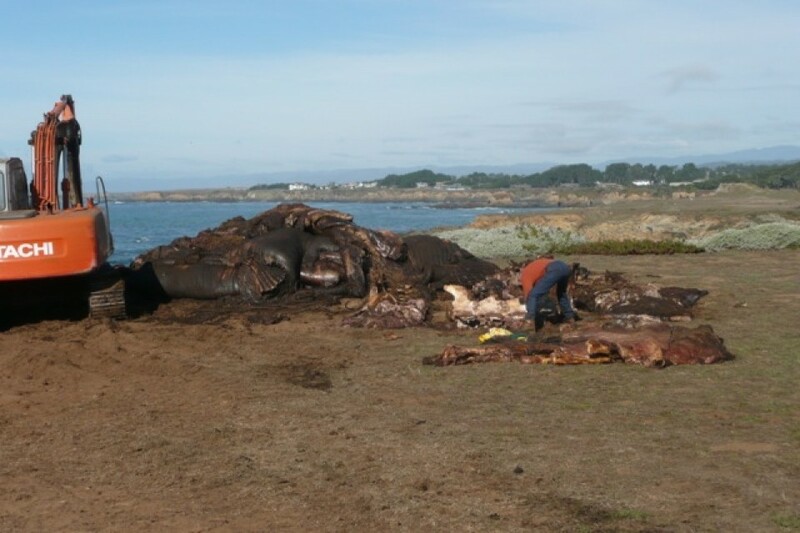 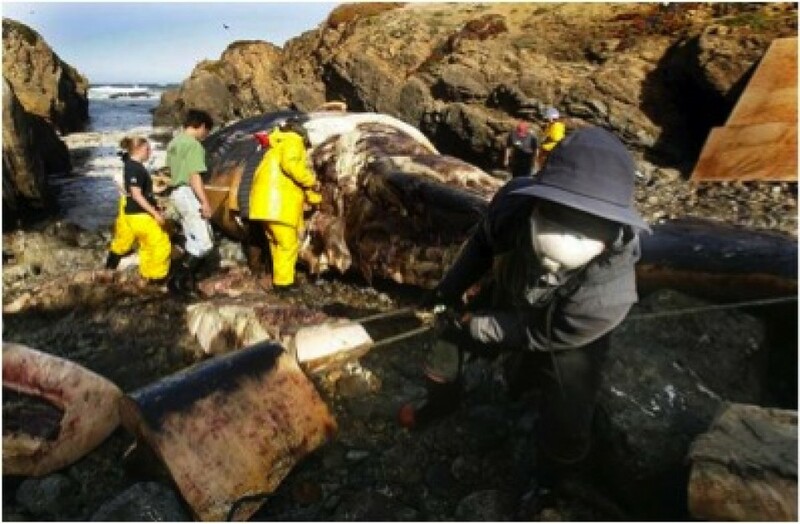 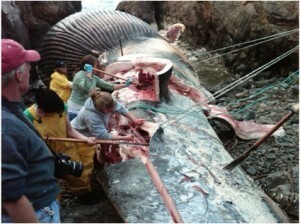 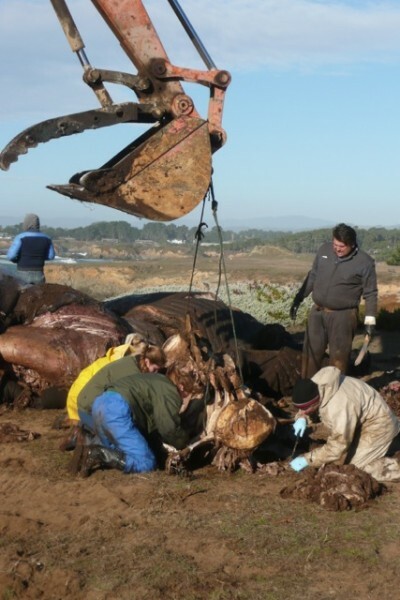 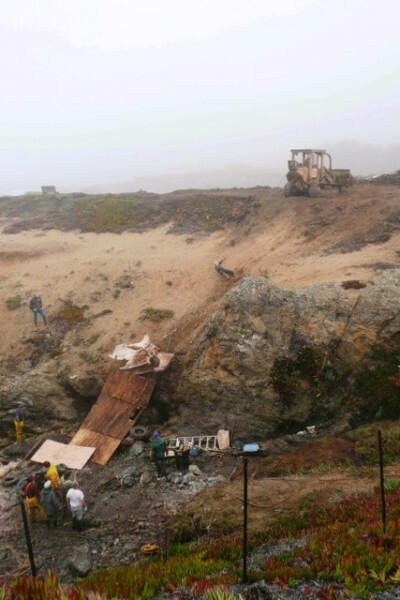 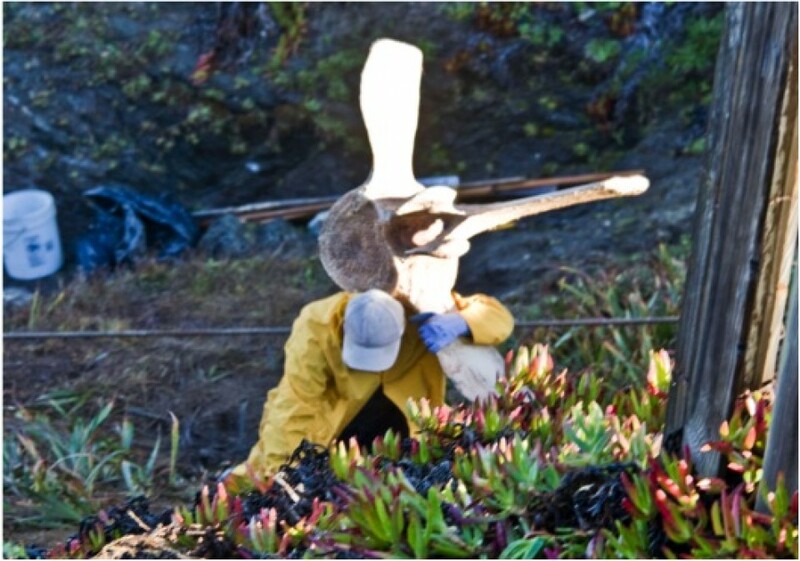 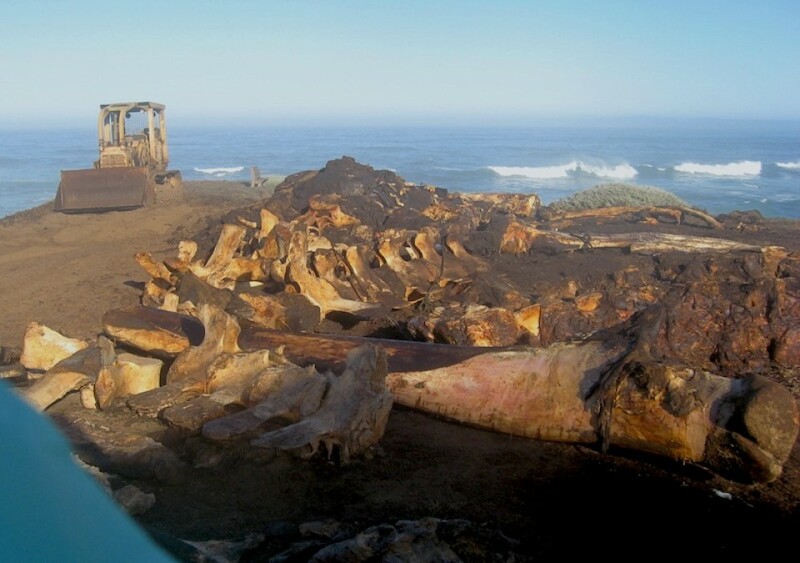 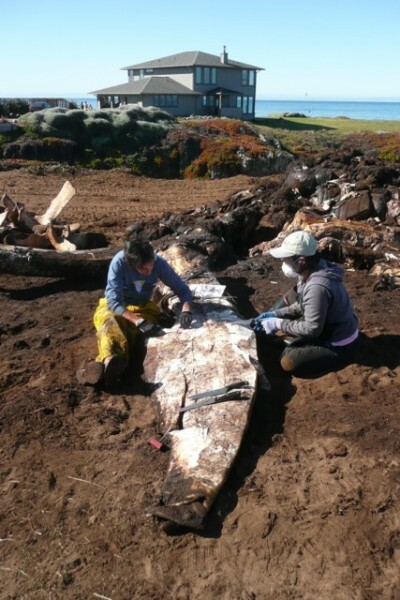 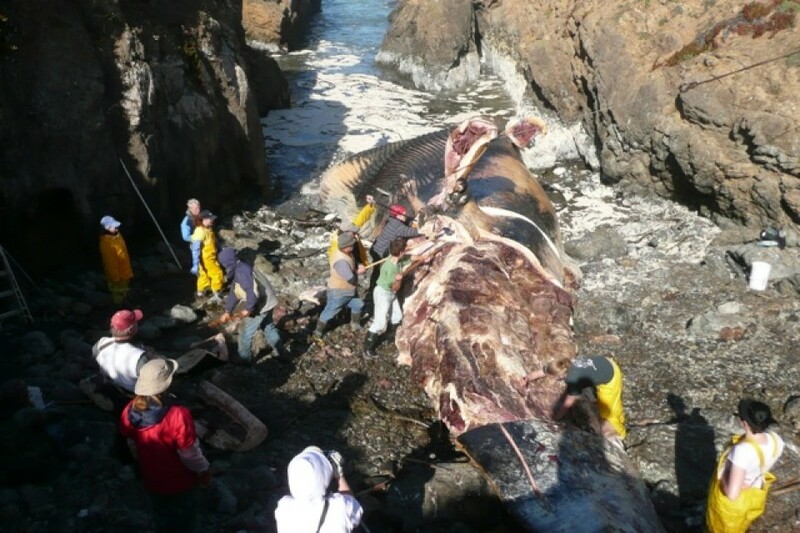 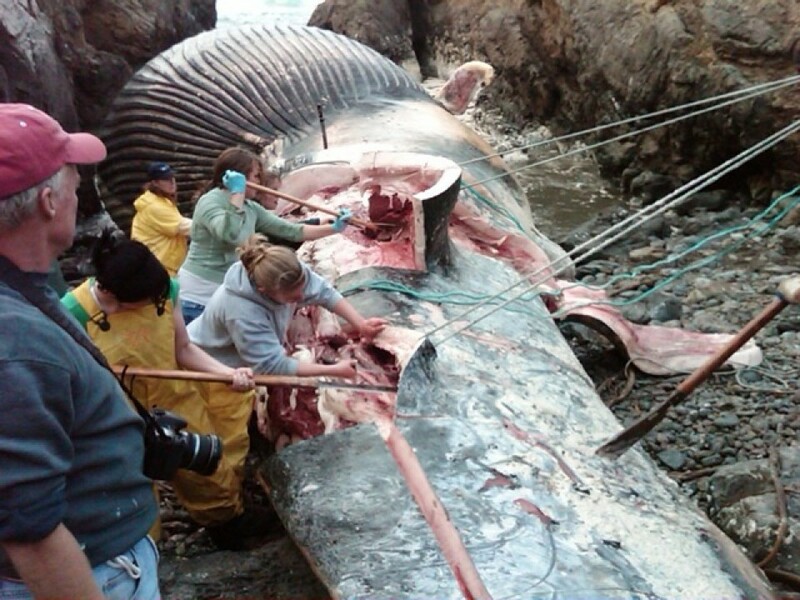 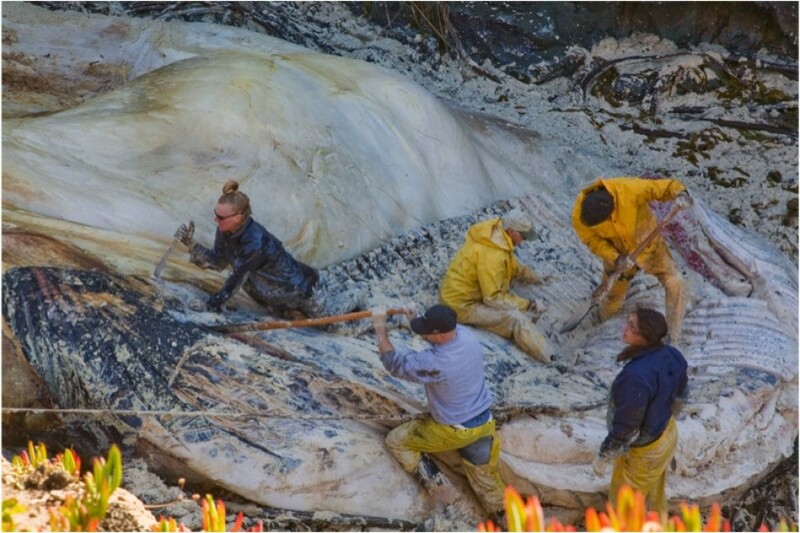 Scientists from Humboldt State University inspect the whale carcass. 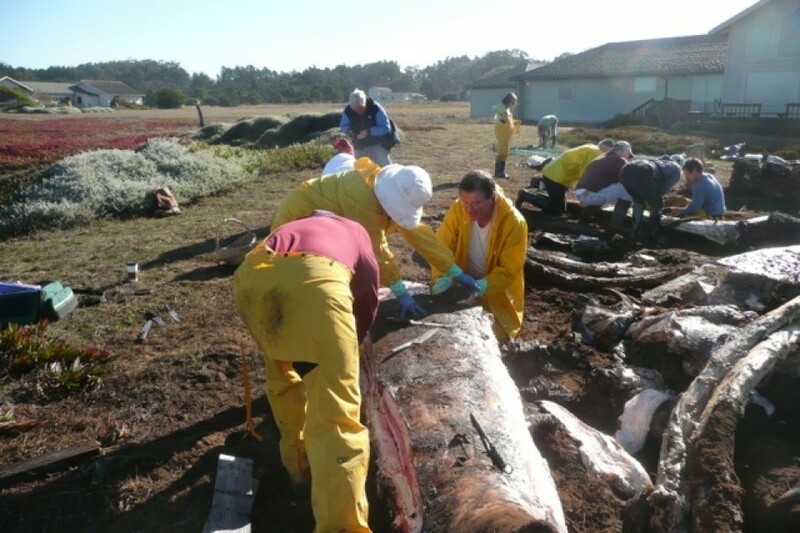 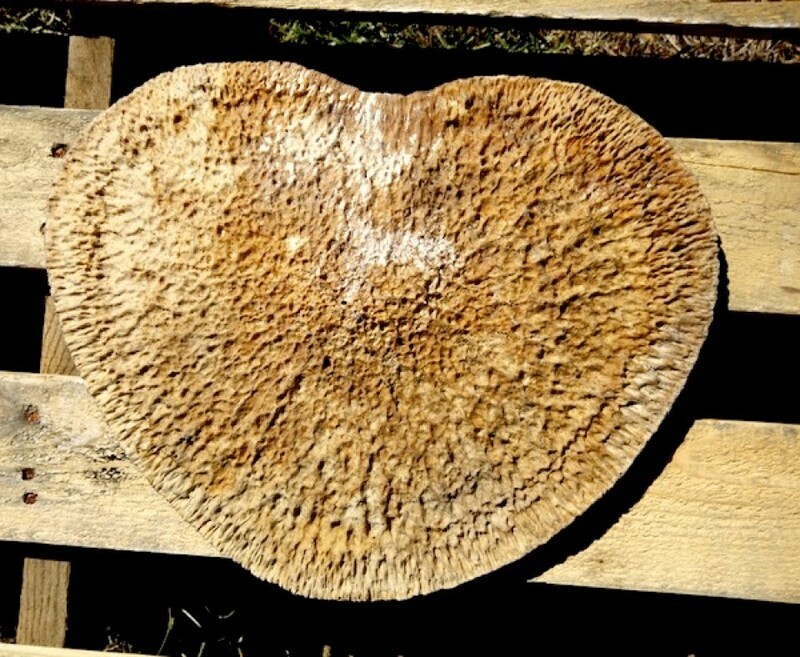 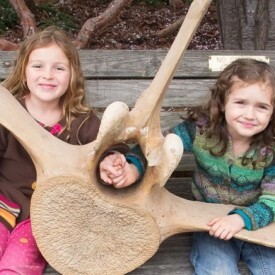 When the devastating news that a 73-ft long female blue whale had suffered a lethal injury from a ship’s propeller off our coast in 2009 became public, the community of Fort Bragg came together. 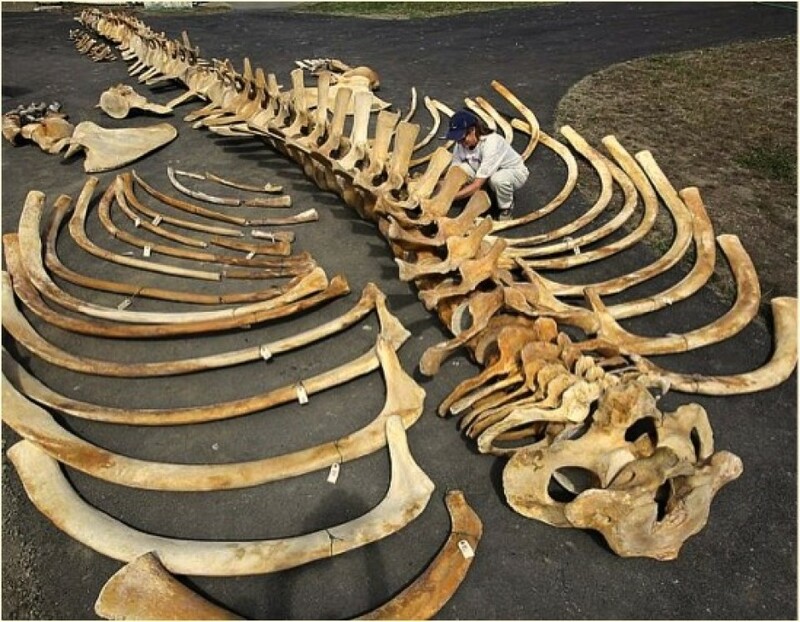 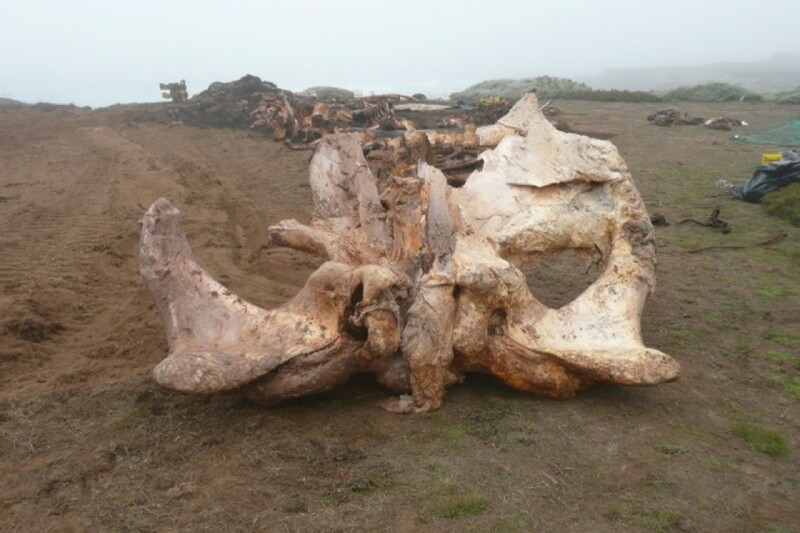 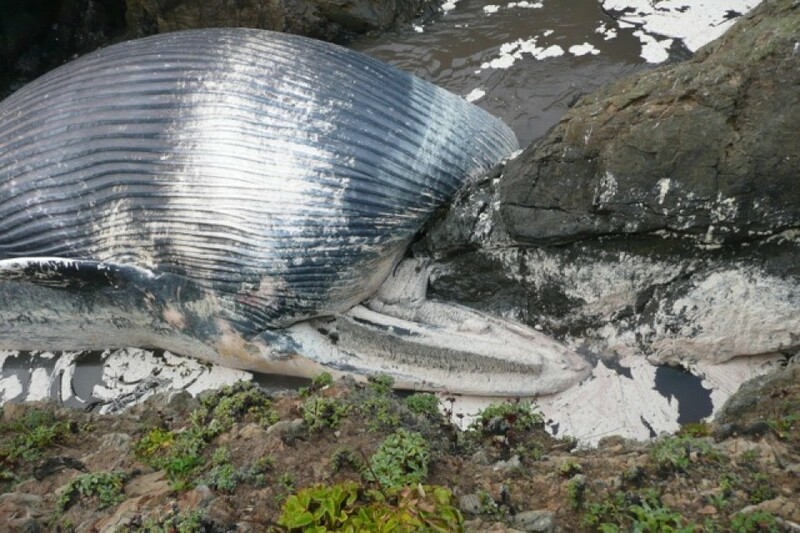 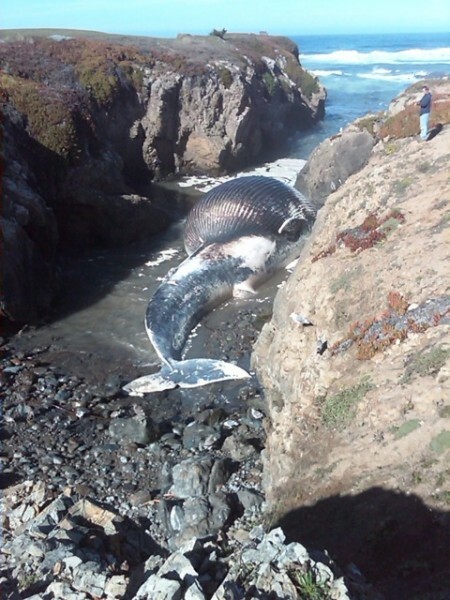 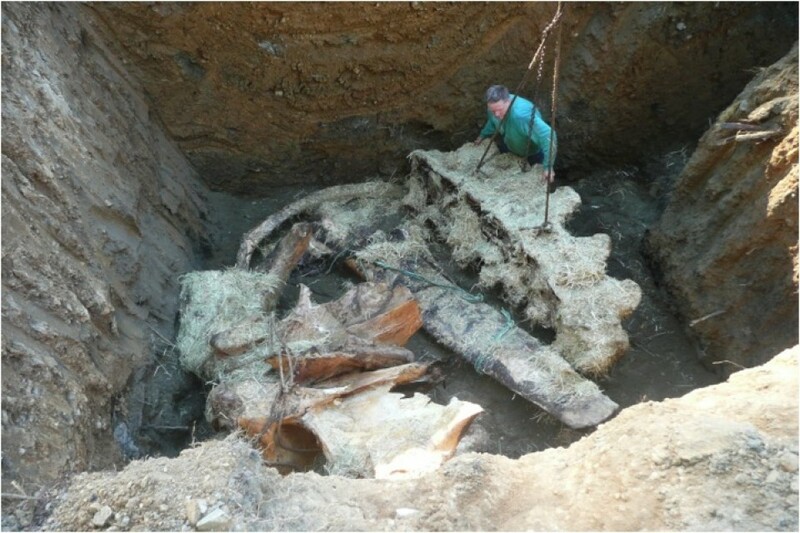 Seeing this beautiful whale washed up on shore was so moving that members of our community voiced an idea to salvage the skeleton for Fort Bragg, regardless of the fact that there would be no agency or university leading the effort. 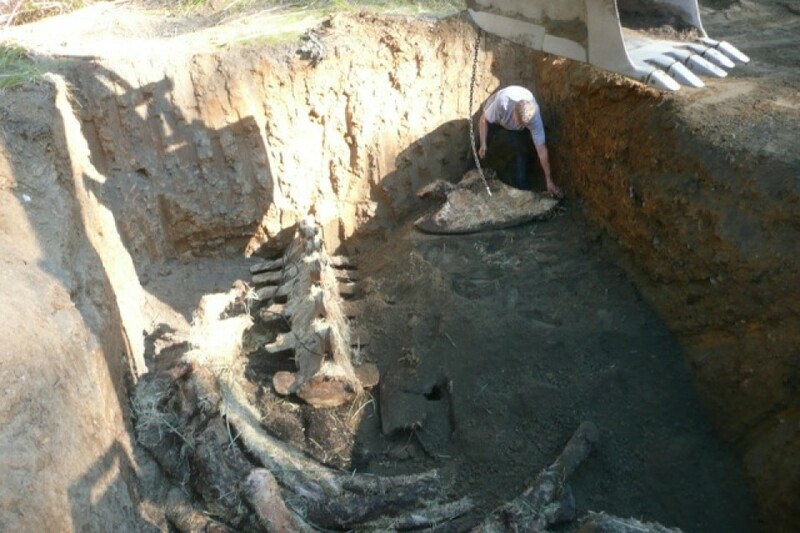 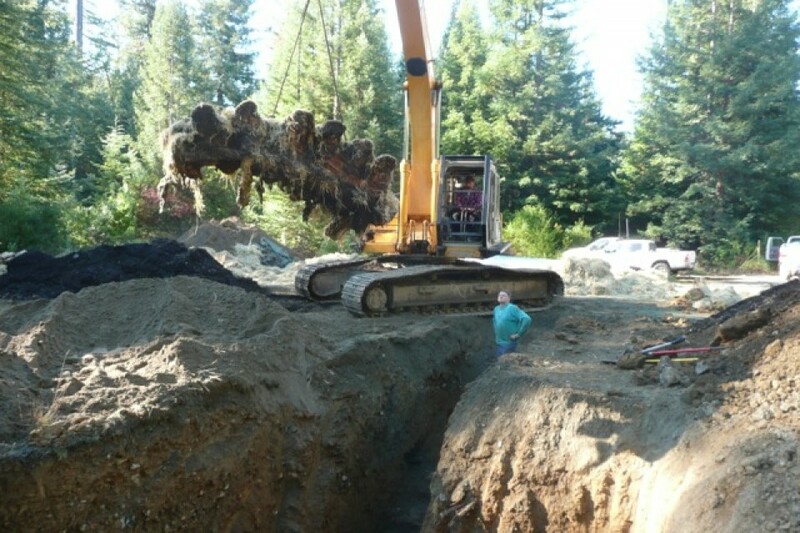 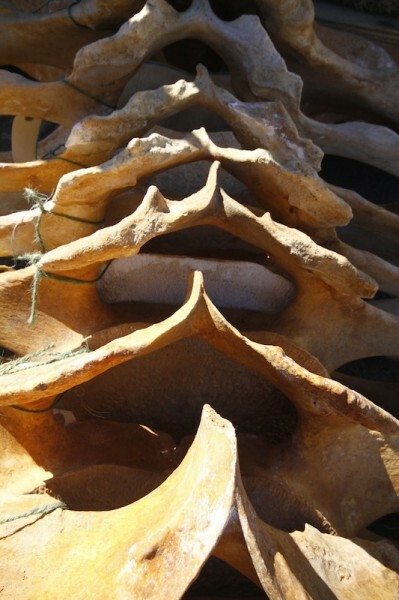 Working with NOAA, the City was able to obtain rights to acquire the skeleton for eventual public display. 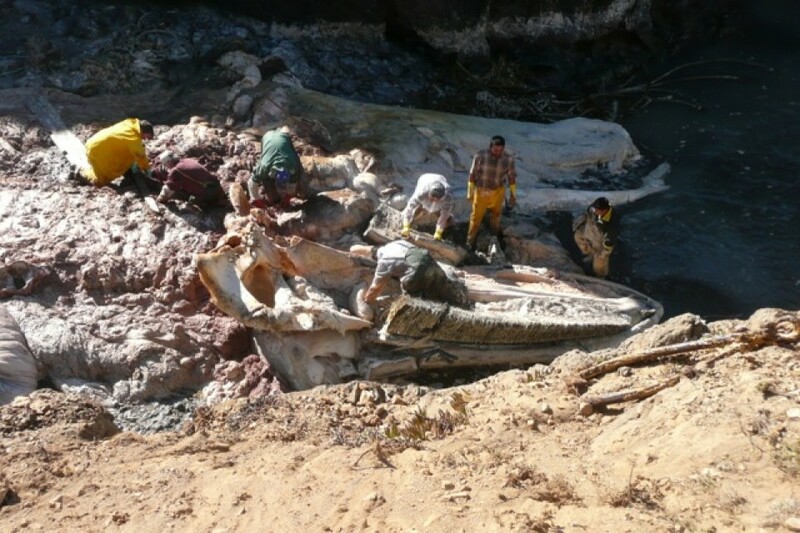 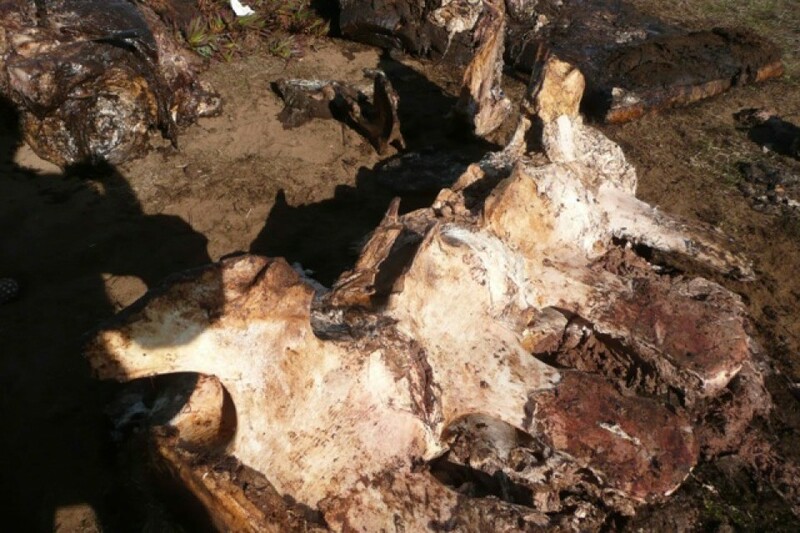 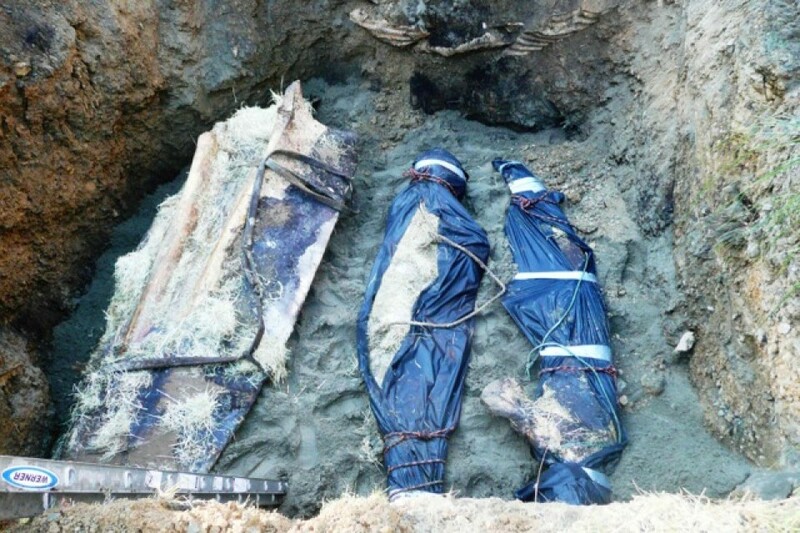 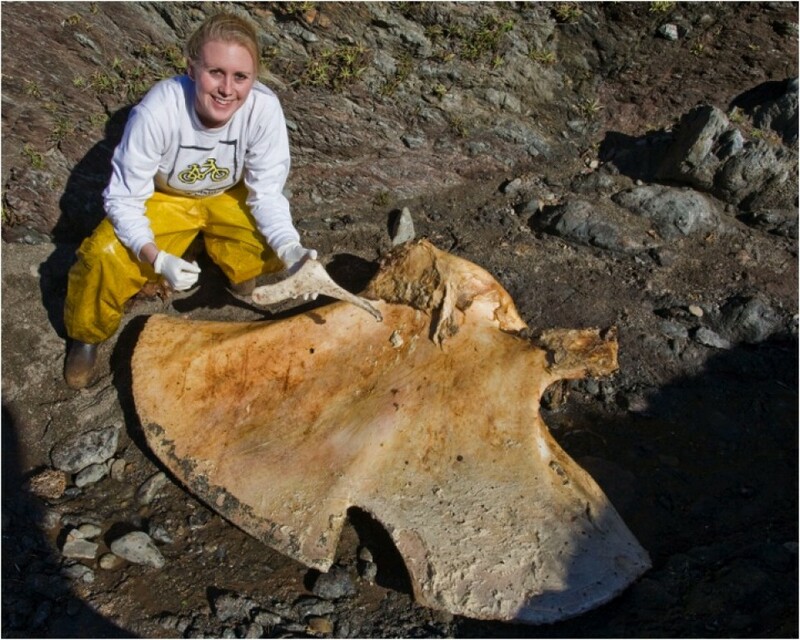 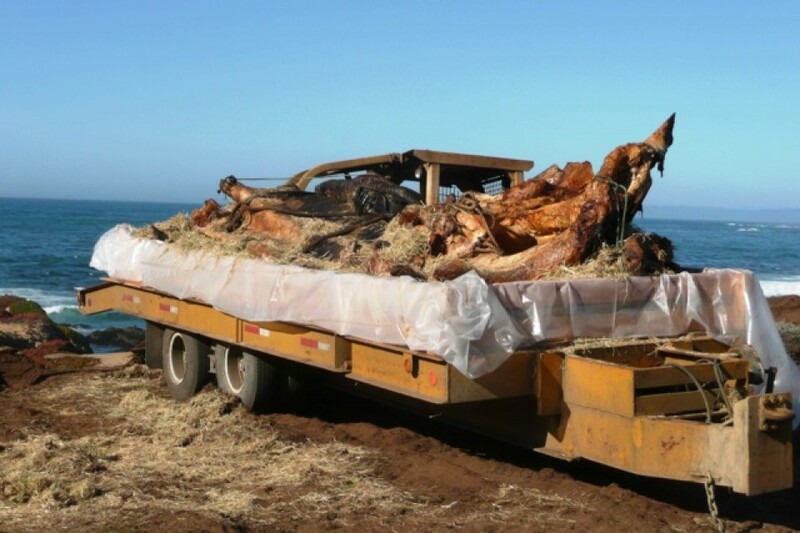 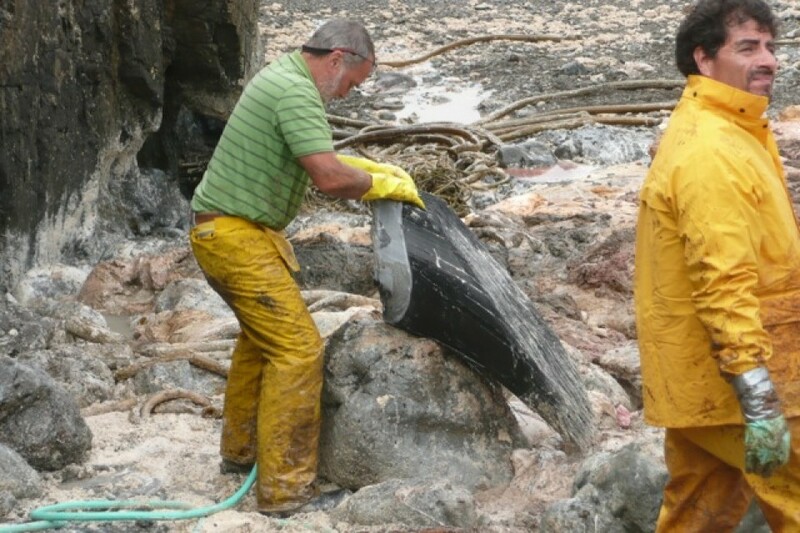 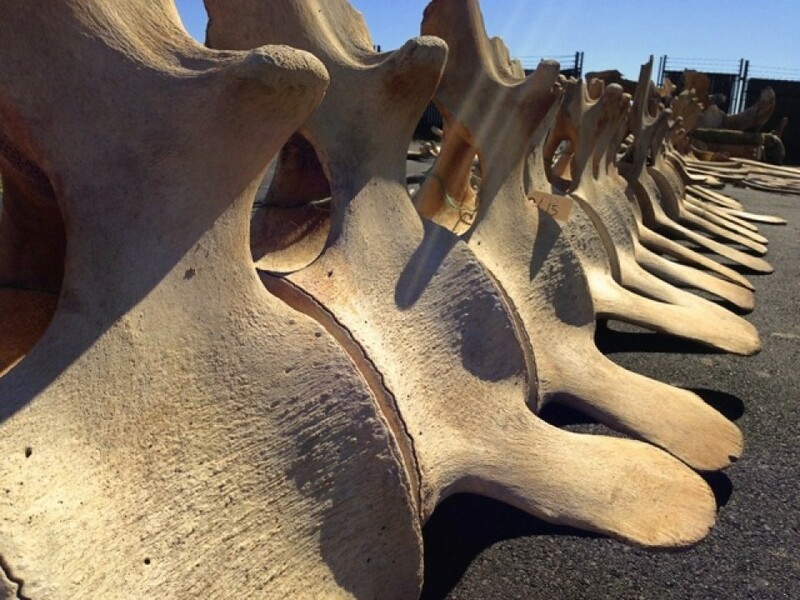 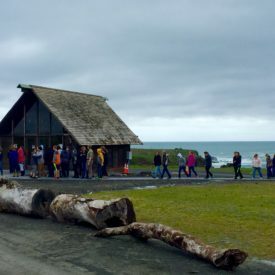 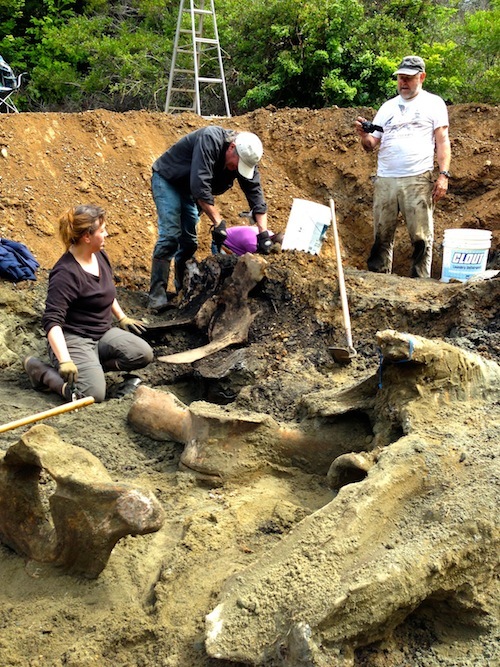 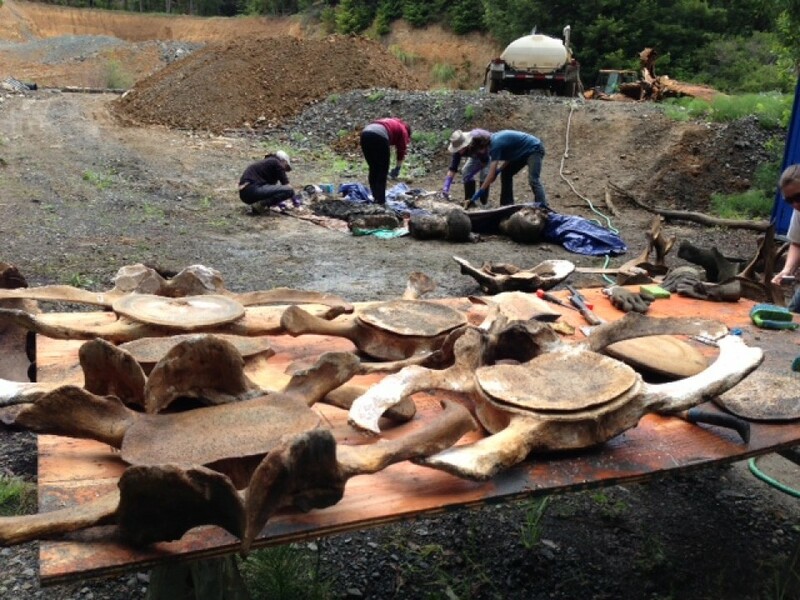 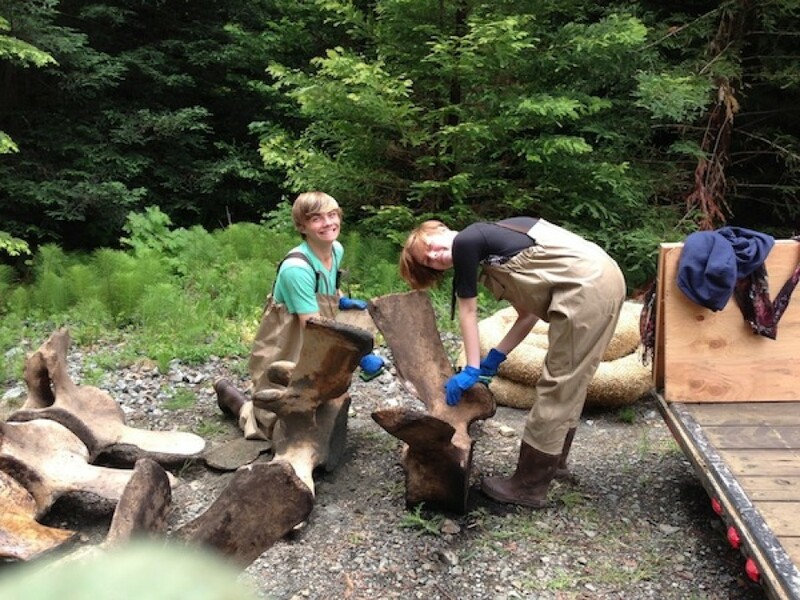 More than 200 people walked away from their normal lives to participate in an unprecedented community effort to haul 70-tons of bones and blubber up a 40-foot cliff and bury the whale in compost out in the forest. 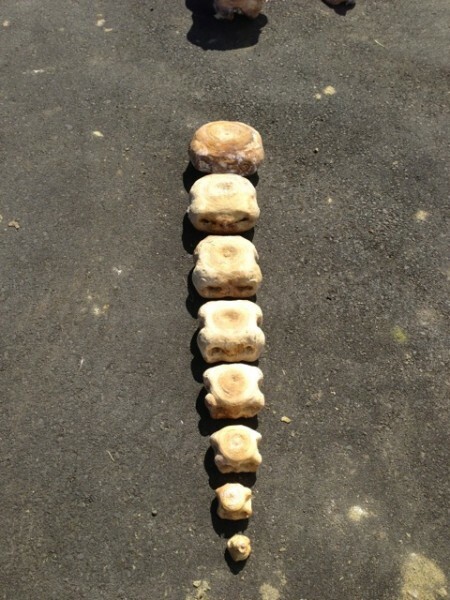 It was a monumental task. 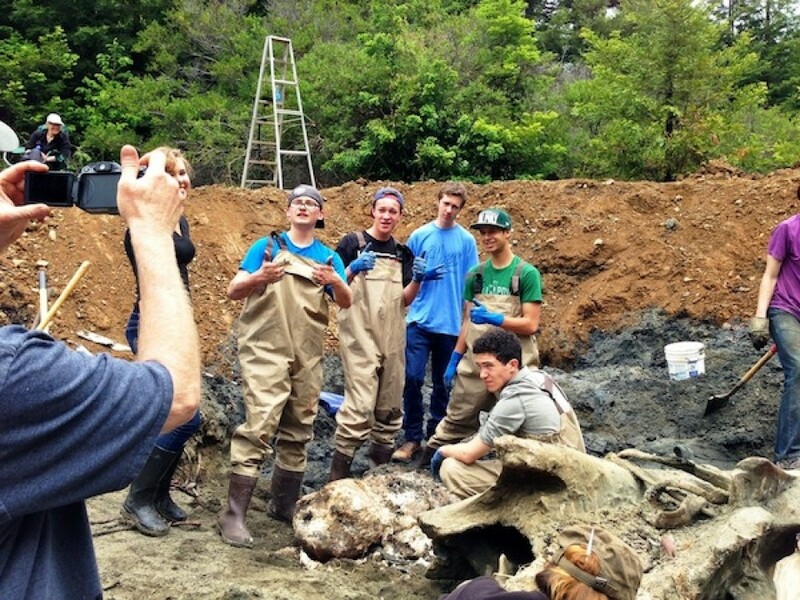 Students from all over got a once-in-a-lifetime blue whale-sized anatomy lesson during the flensing process as we worked with national experts to provide as many samples for research as possible. 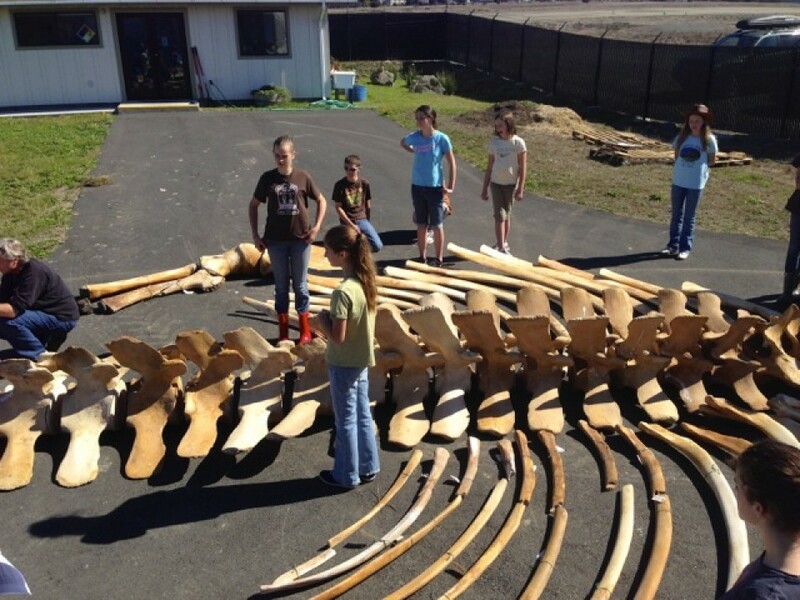 Go to our amazing blue whales page to see the cool research we’ve been able to contribute toward so far. 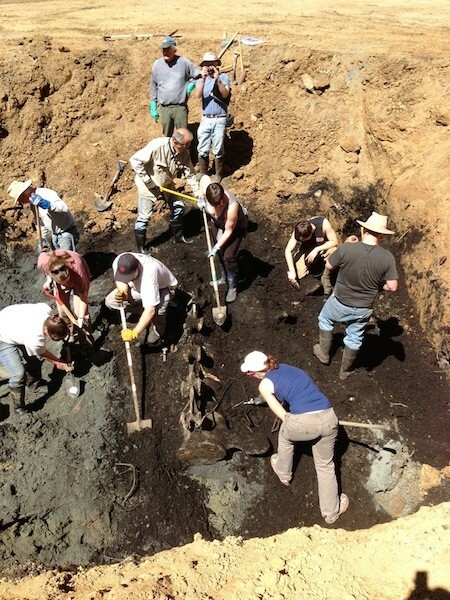 Volunteers remove compost and dirt to reveal the bones beneath. 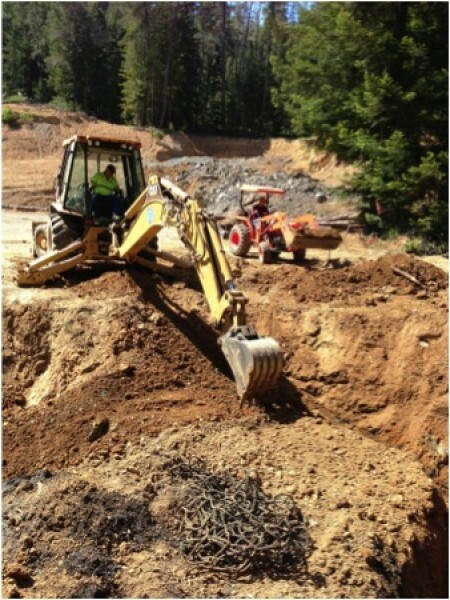 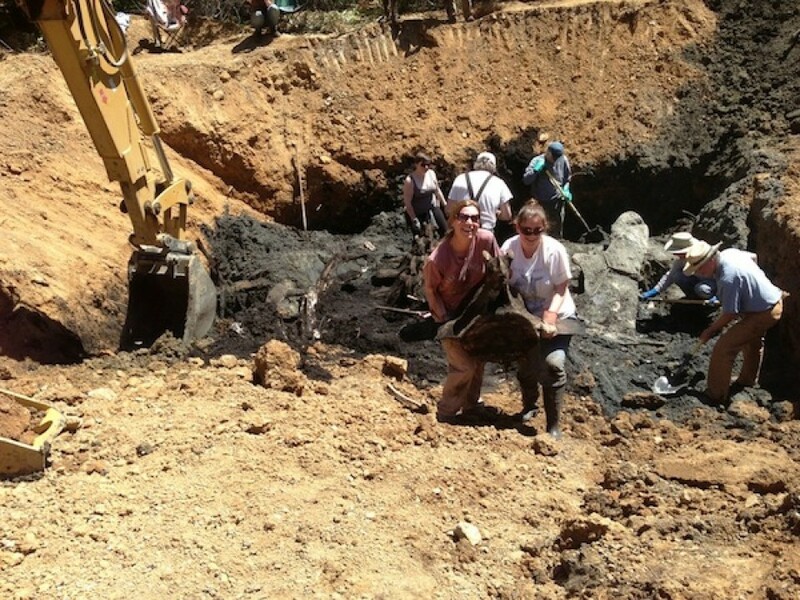 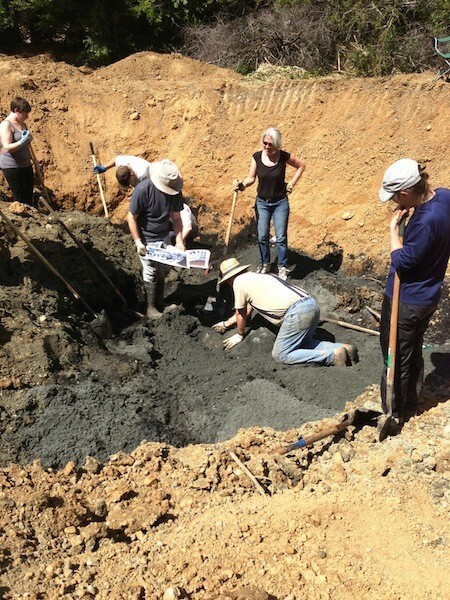 After four years of sitting in compost and sand in large pits in the forest, our amazing volunteers once again came together with the City of Fort Bragg to carefully dig out each bone. 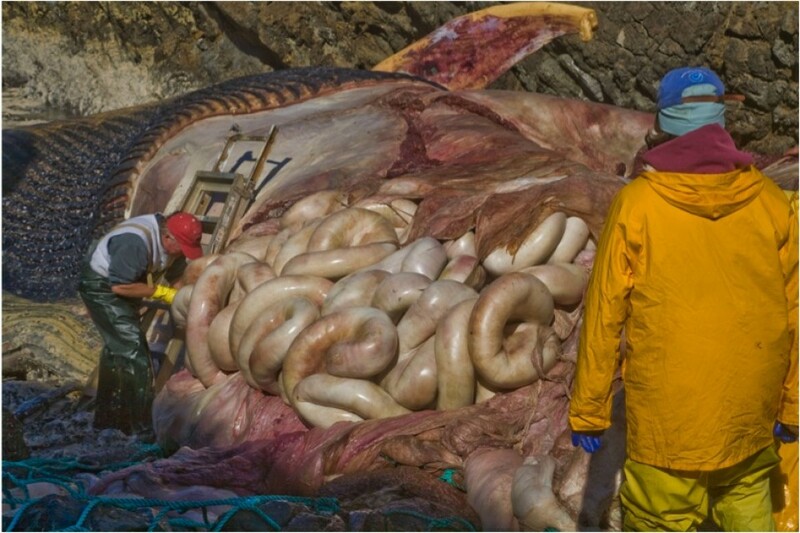 Thankfully, microbes and insects had done a good job, and most of the flesh was gone. 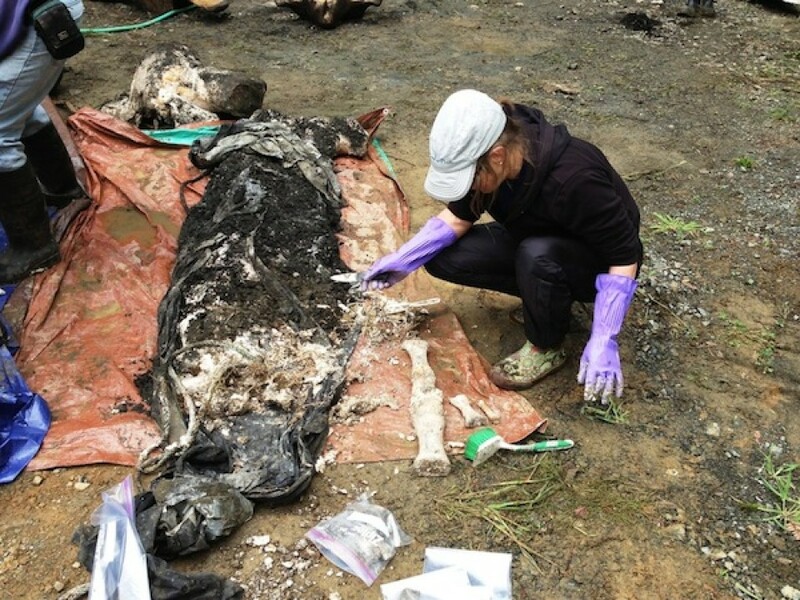 Some bones, like the caudal vertebrae near the tail, were still encased in very strong connective tissue and had to be put back in compost to finish the job. 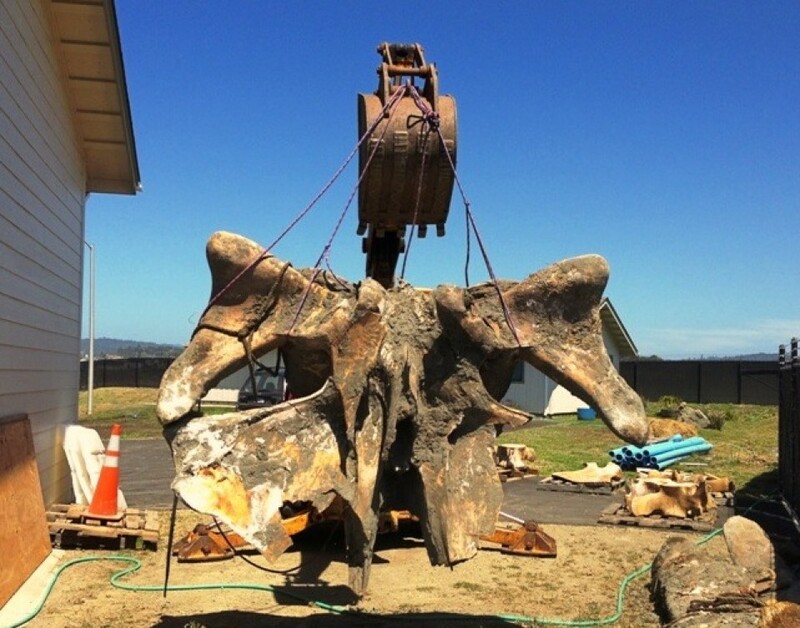 The bones were trucked to the wastewater treatment plant in Fort Bragg where we have been cleaning and scrubbing them (what a great place for this dirty job!) 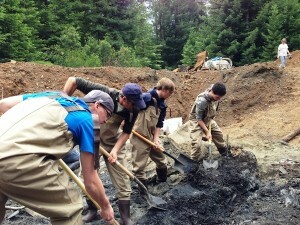 Watch the story unfold in pictures below! 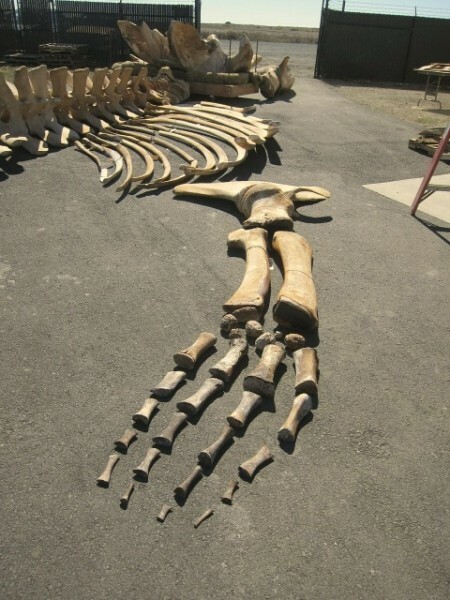 The skeleton is now in storage awaiting funding to begin the next stage of the restoration process: degreasing to remove the (extremely smelly!) 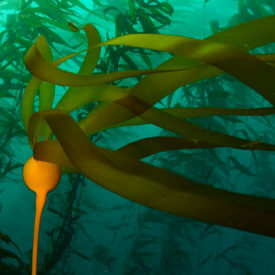 internal oils. 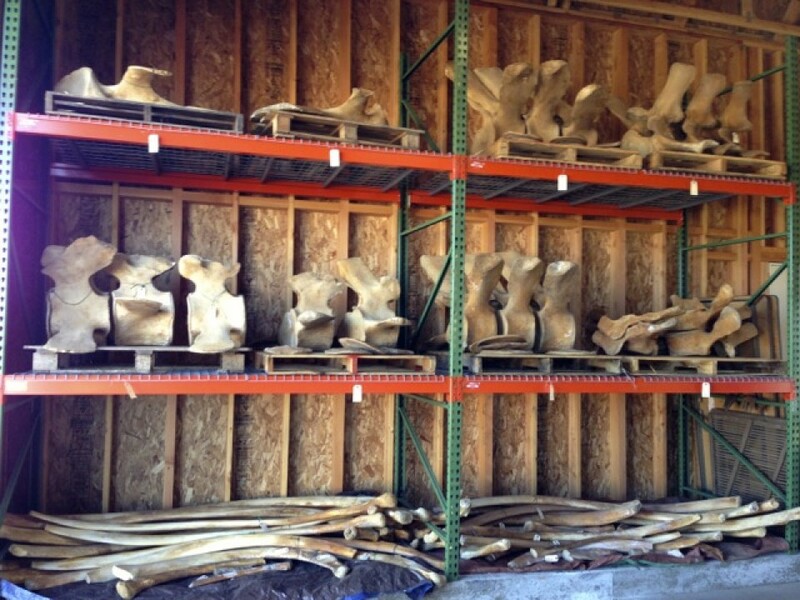 You can help us move on to the next phase of this exciting project by donating today! 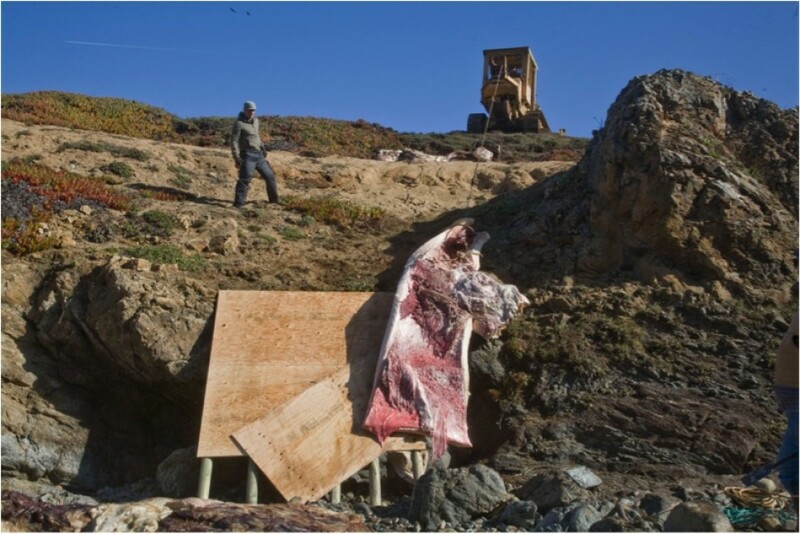 the team at work "flensing"
The last bone up the cliff is the skull! 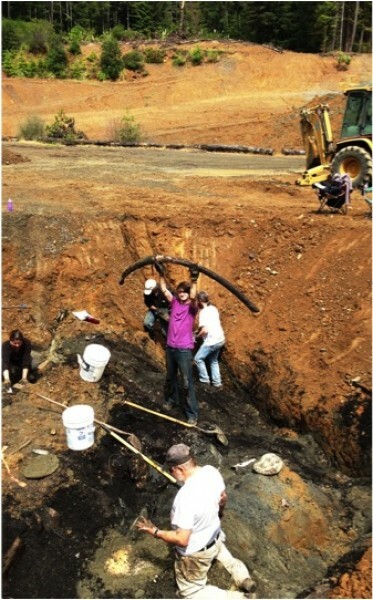 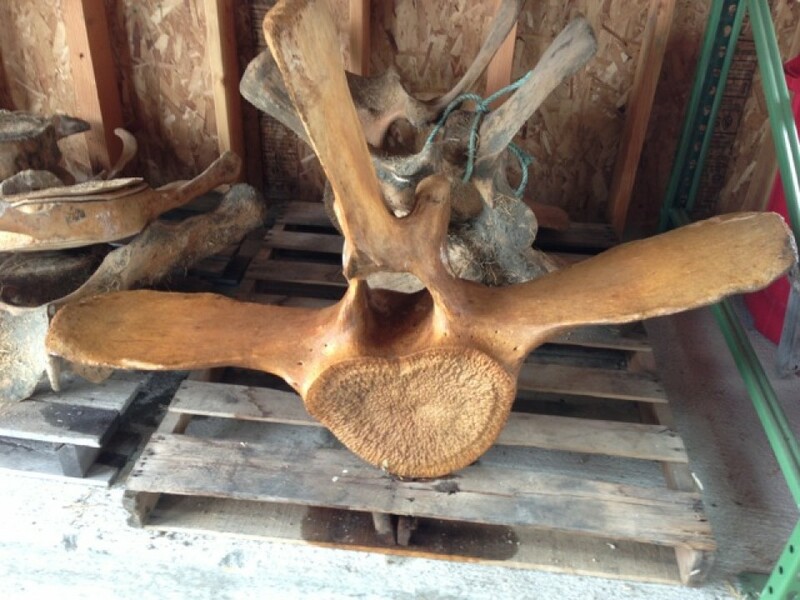 It was very exciting to bring up a bone!